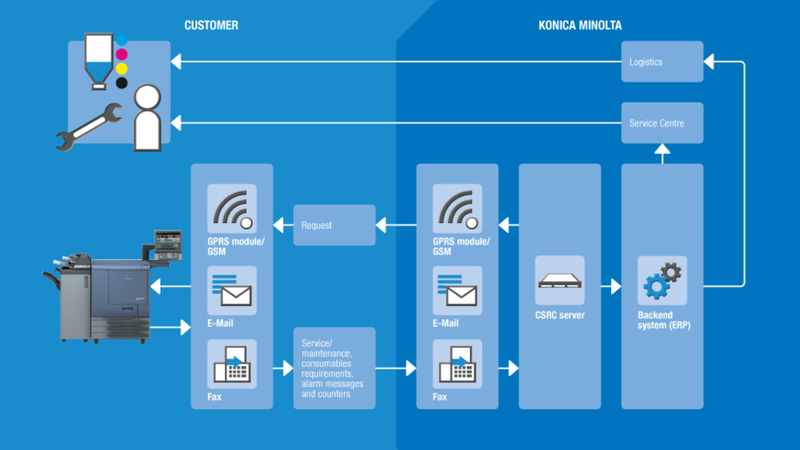 CS Remote Care Global Services comes as an automated monitoring and communication solution which serves as a bridge between Konica Minolta’s output devices and Konica Minolta Service Organisation. It also provides alerts to user/ service support team in case of consumable replacement requirement and technical errors in the machines. It also brings with it a host of automated services for businesses including Automated Billing; Automated delivery of consumables; automated dispatching of customer engineer and Issuance of usage reports. Automated billing- The CS Remote Care takes away manual output counter readings by automatically checking and transmitting the precise readings to the service organisation at specified intervals, ensuring automated and precise billing at all times. Automated delivery of consumables- CS Remote care eliminates the need to manually order consumables like toners. 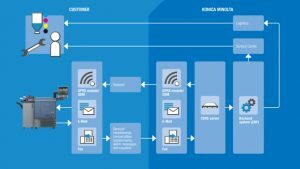 It detects if any of the consumable device has reached its tipping point and the delivery is automatically performed before its depleted. Automated dispatching of customer engineer– In case of the device witnessing any technical glitch, an analysis is performed at once to figure out if the problem can be rectified remotely. In case the glitch requires the presence of a service engineer; one will promptly be dispatched with solution details. Issuance of usage reports- The solution keeps a full track of past usage, maintenance and more for each of the devices for a reduced total cost of ownership (TCO). CS Remote Care Global Services also restricts illegal access via firewall and only authorized administrators can access the data garnered by the solution. It retrieves data from the machine memory, where information including machine adjustment data, machine setting data, counter information and problem information is stored. It never garners any personal information, print data, or any print related job information.